Bino is a amazingly crafted, creative and powerful portfolio template with 40+ homepages and 125+ portfolio variants suitable for both personal and professional use. 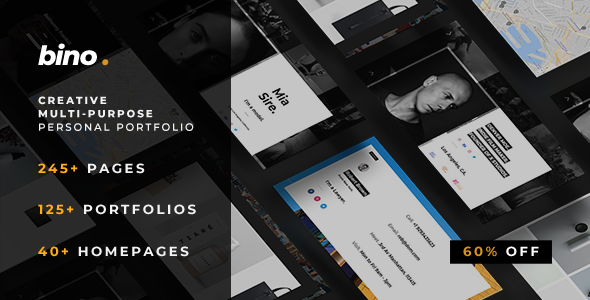 Creative Multipurpose and Personal Portfolio Template. The Template is developed with 2 frameworks- Bootstrap and Uikit. Both of these frameworks are lightweight, packed with unlimited features and very easy to customize. By combining Bootstrap and Uikit Bino enables it’s user to do pretty much anything with the design. It’s versatile, so it may be utilized in many ways like – portfolios, businesses, freelancers, artistic group, artists, professionals and far more. Bino Comes with 245+ different pages which include 40+ exclusive demos, 125+ portfolios, 30 Blog Pages, 08 full project pages, 08 shop / e-commerce pages and also 35+ extra pages. The design and functionalities are created by amazing technologies like HTML5, CSS3, Bootstrap 4 and Uikit. Get a unique and professional looking website easily with Bino- Stop overthinking, get a copy of Bino today! Smooth scroll with one page home page ready demo. Team members and clients grid and carousel. Tabs with title and icon. Note: images included in the preview website are not included with main purchases.